A Holiday classic now organic! 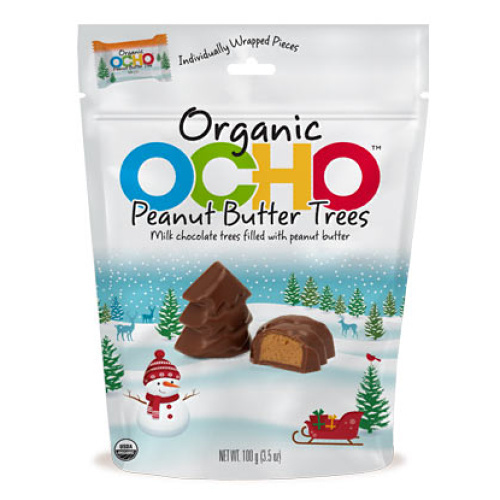 Yummy, individually-wrapped organic milk chocolate Christmas trees filled with peanut butter. These little trees are the perfect addition to an Christmas stocking or Holiday party! Ingredients: Organic milk chocolate (organic sugar, organic cocoa butter, organic whole milk powder, organic chocolate liquor, organic soy lecithin (emulsifier), organic vanilla), organic peanut butter (organic peanuts), organic peanut flour, organic cane sugar, organic peanut flour, organic cocoa butter, organic cane sugar, organic sugar (organic cane sugar, organic tapioca starch), and sea salt. Approximately 10 - 10g (0.35oz) trees measuring 1.5" x 0.1875" x 0.5" per bag.